Roddy’s Folly is published by Connor Court Publishing. Roddy Meagher’s legacy as barrister, scholar, wit, and aesthete is legendary. When he retired from the New South Wales Court of Appeal, the Chief Justice, Jim Spigelman, praised him as “the most widely loved judge of his time” and “one of the intellectual giants of our legal history”. Freeman’s biography is the first book-length study of R. P. Meagher QC. It considers his relationship with the Roman Catholic Church, the University of Sydney, the Australian Bar, and the tradition of legal scholarship to which he made a monumental contribution. In doing so, Freeman tries to get inside the mind of the man, and offers an analysis of Meagher’s attitude to feminism and political correctness, as well as his place in Sydney’s bohemian and establishment circles. This discussion is set within an account of his marriage to the painter, Penny Meagher, and the central place of art in their life together: for her as artist; for him as art collector. 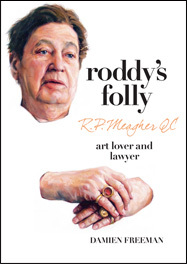 Roddy’s Folly draws on interviews with a range of leading figures in Australia’s legal, political, ecclesiastical, academic, and artistic life, including Sir Laurence Street, Murray Gleeson, Jim Spigelman, Cardinal Pell, Pierre Ryckmans, Dame Leonie Kramer, Marie Bashir, Edmund Capon, Glenn Murcutt, David Handley, Michael Kirby, and John Howard. Michael Kirby’s humorous sketches of the view from the Bench were sketched by him in court and presented to Meagher when the two judges sat together. These previously unpublished sketches are reproduced for the first time in Roddy’s Folly, shedding light on the lighter side of life on the Bench. The book was launched by the Hon. Tony Abbott MHR at the Old Sydney Law School on 23 April, 2012. To see a video of the launch, produced by Justinian’s Richard Ackland, click here. To read the remarks delivered by Justice J. D. Heydon at the launch, click here. To read Peter Coleman’s column on the launch in the Spectator, click here. Freeman has been invited to speak about Roddy’s Folly at a number of events. To listen to “Larger than Life: Roddy Meagher QC”, a podcast of Freeman’s speech at the Sydney Institute, click here. To read the Sydney Institute transcript published in The Sydney Papers, click here. To read “Roddy’s Folly and Kirby’s Cartoons: Michael Kirby, Roddy Meagher and the Challenge of Friendship”, Freeman’s remarks at a breakfast for Sydney University alumni, at which he introduced Michael Kirby, who spoke about his relationship with Roddy Meagher, click here. To read “Roddy Meagher: a life in art”, a talk that Freeman gave at the Art Gallery of New South Wales, click here. A number of other articles shed further light on the book’s author, its subject, and illustrator. To read the Australian National University’s National Centre of Biography obituary that Freeman originally wrote for the Australian Financial Review after Meagher died on 3 July, 2012, click here. To read “R.P. Meagher and the idea of a university”, a paper that he contributed to the Australian Bar Review’s tribute issue to R. P. Meagher, click here. To read “Scribblers on the Bench”, an essay he published in the Australian Financial Review, on the eve of the launch of Roddy’s Folly, which discusses Meagher’s relationship with Michael Kirby, click here. To read “Educating Roddy”, an article by Jonathan Pearlman in the Sydney Alumni Magazine (July, 2012) about Freeman’s relationship with Meagher, click here. To read Paul Sheehan’s opinion piece in the Sydney Morning Herald about Roddy Meagher and Freeman’s biography, click here. To read an article by Fr Ross Jones SJ, Rector of Saint Ignatius’ College, Riverview, about the discussion of the Jesuits in Roddy’s Folly, click here.